Below you will find out how to make drums & percussion musical instruments crafts projects for kids to create musical instruments such as drums. This particular drum makes a very nice noise. Remove the top of an oatmeal container, discard it, and glue plain paper or construction paper around the cylinder. Decorate the sides and end of the box with crayon designs. Punch 2 holes near the bottom, on opposite sides, for the carrying string. Adjust the string to the size of the child. For the mallet, Ask Mom or Dad to make a starting hole in a cork with an awl and push a glued stick into the hole. Put a patch of brightly colored fabric over the cork and tie tightly around the stick with string. The children will need help getting it tight enough. Fasten a string at the other end of the stick, long enough to go around the wrist. You can make great drums out of things around the house. (1) An empty oatmeal box makes a good drum. Your parents canl help you tie a string at each end of the drum so you can loop the string over your head. 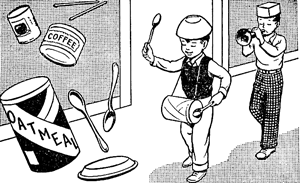 You can march around and beat the ends of the drum with your hands or with spoons. (2) If you have several empty pans or tin plates, you can set them on the floor. The different pans will make different sounds. (3) For little drums, you can use tin cans. Coffee cans make good drums. Your parents mustl make sure there are no sharp edges on the can. Place them on the floor in front of you and beat them with small sticks. There are two kinds of drums which boys and girls can make. One is a kettle drum and the other is a barrel drum. To make a barrel drum you will need a hollow cylinder of some kind. A barrel or a keg may serve as the foundation. Each end must be covered with a skin. The best covering for a drum is a skin called a "drumhead." It can be purchased in stores where musical instruments and music supplies are sold. It is an expensive material to use. Very strong paper or film cloth will serve the same purpose if the drum is not going to receive rough handling. One or two coats of shellac or varnish covering the cloth will make a better-toned drum. Only one skin is needed for a kettle drum. A mixing bowl, a tin pail, or a wooden chopping bowl are a few of the things that can be made into a kettle drum. The drumhead must be stretched tightly and held firmly in place. There are three ways in which it may be fastened to the body of the drum. (1) If the drum is of paper use thumbtacks, as you see in figure 1. (2) If there is a hoop around the drum body a strong cord may be wound tightly around the edge of the skin to hold it in place. A margin of an inch or more should be left for fastening the skin, as in figure 2. (3) The two skins may be held on the drum body by lacing a cord back and forth between them, as pictured in figure 3. Paint the drum body in your choice of color. How to Make Coffee Can Drums - Learn how to make this cute coffee can drum along with some denim, yarn, and a few other things. Tom Tom Drums & Drumsticks- Learn how to make these tom tom drums & matching drumsticks. Wooden Bowl Drums - Learn how to make these drums from a wooden bowl & an innertube. Make the sticks from dowels. Make a Musical Drumming Instrument with Walnut Shells - Learn how to make this cool walnut shell musical isntrument. A Christmas Drum with Nuts - - Homemade.pngts for friends and neighbors don’t have to be complicated. Inexpensive items can be transformed into cute, clever items with little or no effort. You don’t have to be extremely crafty or creative to make an attractive Christmas drum for someone during the holiday season. A Home made Drum - - Parents have a difficult time finding projects to do with their kids. Making a leather drum is a great project that is easy to teach children. Once the drum is finished your child will be able to expend some extra energy (on the drums) and you may even want to make their new toy your one. A Native American Drum DIY Drum Making Activity - - Making a Native American Drum is quite easy. You might ask what got me to make this kids craft. That's easy too. I had an empty Quaker Oats container after making supper tonight. An African Drum Crafts Ideas - - Kwanzaa is often celebrated with traditional African music, with the rhythm provided by African drums. Here is a craft idea for making your own. African Conga Drum DIY Project- - Making objects from junk can be oh so much fun. You have most of the materials necessary to make a dumbek or conga drum, right in your own backyard. Now you can make your own African drum! African Djembe Drum : How to Make African Drums - - Like the African artisans you learned about yesterday, you can create your own Djembe (Jem-Bay) drum. This is a fun project, though it does take a bit a time. I recommend it for third graders and older. African Drums: Ashikos - - If you have ever had the opportunity to hear someone playing an African drum or witnessed a full blown drum circle and wish you could make your own drum ... here is your chance. Bongo Drums - - Bongo drums are a great instrument for young, aspiring musicians. They also are an easy, fun craft project. A coffee can or oatmeal canister already makes a pretty good drum. Attach them two together, decorate them, and make some minor alterations and you're ready to jam. Read on to learn how to make bongo drums. Bongo Drums for Kids to Make with Easy Directions - - Use your bongo drum to create different sounds with your fingertips or with the palm and heel of your hand. Bucket Drum - - Acts that feature bucket drums and trash can drums play everywhere from the streets of New York, accompanied by a jar for donations, to the local fairs. If they're exceptionally lucky or good, they even make it to the stages of Las Vegas and other tourist spots. Learn how they made those instruments out of recycled buckets. Build a Conga Drum with DIY Instructions - - A conga drum is a musical instrument of African origin, made of hardwood for the body and animal skin for the drumhead. People use conga drums for their novelty and musical enjoyment. Buying a conga drum can be expensive, but you can make your own with a few materials. Cajon Conga Drums - - A Cajon is a percussion instrument first built in Peru by African slaves in the 1800s. Named after the Spanish word for "box," a Cajon is literally a box-shaped hand drum with a thin membrane, usually plywood, which reverberates after being struck. Children's Bongo Drums - - Bongo drums were brought to Cuba with the slave trade and are usually associated with Cuban music, such as salsa; although; today bands and orchestras frequently use them. Make them out of wood or metal, with tops constructed from animal skins or synthetic materials. A toy set of bongos for children is perfect for teaching rhythm. Make toy bongos out of materials you have around the house. Children's Craft: African Bongo Drums - - Learn how to make your own drum right at home with this easy to follow instructions. Children's Marching Drum - - A simple drumstick can be made from a wooden skewer and a Styrofoam ball. Learn how to make a children's marching drum in this free crafts video. Chinese Drum Crafts for Children - - A popular old-fashioned noise-making toy, the Chinese drum (rattle) is twisted in the hand so that the beads bounce of it and make a noise. With practice you can get a good rhythm going! Here's one the kids can make themselves. Civil War Drum - - While today’s children may enjoy staging mock battles, warfare was no game during the 1860’s. Nine-year-old John Lincoln Clem survived two wounds and Confederate imprisonment to become the youngest non-commissioned officer in Army history. Like Clem, most boys started as drummers, calling soldiers to meals, waking them in the morning, and rallying them for marches. You can make a Civil War style drum, too. Coffee Can Drum Arts & Crafts Activities - - Drums are an important part of life and ceremony in many cultures. Here is a simple method for you and your students to create a fun sounding drum as you celebrate the cultures of the world. Coffee Can Drum for Kids - - this simple and colorful craft for kids is also a recyclable! I'm sure we all went through the banging on a coffee can, pot or oatmeal container phase, but here's a way to "professionalize" that for kids! All you need is an empty coffee can, construction paper, felt, wooden dowels (chopsticks work will in a pinch), foam balls and yarn. Check it out! Craft ideas kids: Tom-Toms - - Easy to make yet fun to play with, you can learn how to make your own tom-toms with our easy instruction guide. This is a great craft project for the music loving imdividuals. Creative Coffee Can Drum Craft for Preschoolers & Toddlers - - Create your own music with this fabulous easy-to-make drum using recyclable materials. Diego’s African Safari Drum - - Kids will have a blast running around the backyard with Diego's African Safari Drum. Double Drums - - These drums are twice as much fun as any other kind! Dragon Drum - - Calling all percussionists! Drums are easy to learn to play and their sounds are recognized around the world. These red Chinese replicas are gorgeous to look at, too. Drum Bank - - This cool craft is a coin/money bank that looks like a drum. Drum Christmas Ornament - - This adorable drum Christmas ornament makes a delightful.pngt for a music teacher or simply as an attractive decoration on the tree. It takes little time to make and the supplies are common and likely in your craft box already. Drum Craft - - Create drums from a recycled container and make some music! Drum Head Out of Packing Tape - - It is possible to make drum heads inexpensively that can be used on their own, but you can also mount these onto almost any round or tube-shaped item to make an even better-sounding drum. Traditional drum heads have been made from the skin of animals, but in recent years many drum heads are made out of plastic; you can make your own drum heads by wrapping an embroidery hoop with packing tape. 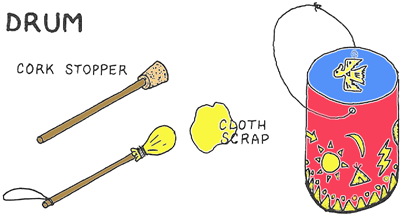 Drum-making Craft - - Here we show you two common types of drum crafts - coffee cup and African - using recycled materials. Drum Noise Maker Crafts - - Of course ringing in the New Year would not be complete without something to bang on. So save your pots and pans and make some drums for the kids to bang and get loud for the New Year. Drum Ornament - - This is such an easy craft to make! You can find the easy to follow instructions when you click on the link. Drum on a Stick - - Enjoy the lively rhythm of a handmade percussion instrument! This one is designed to look and plays like the damaru drum of Nepal. Drum Set Out of Buckets - - Do you want a drum set but can't quite afford one? There are ways to make your own complete drum set using plastic buckets and other materials like paint cans. This article provides instructions on how to build a nice plastic bucket drum set by using some basic sound principles. Drumroll, Please - - This easy-to-make instrument just can't be beat -- no, wait, it can! It provides even the youngest musicians with a wonderfully rich and resonant sound. Click here for instructions on how to make the mallet drumsticks. Dundun Drum - - Have you ever heard of a talking drum? Create an authentic replica of a Nigerian dundun drum. Make it talk and sing! Easy to Make Drum - - A cardboard oatmeal container can become a creative percussion instrument in this easy to make craft. Folk Drum Instrument - - Folk instruments are fun for children to make and play. You can create them from materials that are typically found around your home and can be purchased at any arts or crafts supply store. Small children will need help with using scissors or the stapler, but older children can make their folk instruments independently. Here are instructions for how to create a few fun and musical folk instruments. The instructions for each instrument are for one child. Friction Drum - - These very simple instruments can also be made as part of a team building process for organizational and corporate groups who are interested in innovative ways to break the ice and build connections and community while having fun. Hanging Drum - - This is a Great Craft You and Your Toddler Can Do Together to Make Music. Hatbox Drum - - Nothing stirs the hearts and stiffens the backbones of Continental soldiers like a rousing fife and drum cadence. Boys as young as eight were known to have run away to become drummers for the army. Often at the head of a troop contingent, these brave musicians took fire right along with their fellow soldiers, armed with nothing more than fife or drum. Read on to learn how to make a hatbox drum like the ones they used. Here I Come Drum - - March and dance all day with this easy-to-make oatmeal box drum. Young children love this simple music-making craft! Homemade Bongo Drums - - Bongo drums are percussion instruments used in Latin American music. 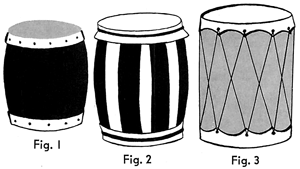 Played in pairs, each set of bongos consists of a macho (male) and hembra (female) drum, tuned to different pitches. Bongos are played by hand and help keep the rhythm of dances consistent and quick. Make your own pair of homemade bongos. Homemade Bongo Drums - - All you need is some items from around your house and you'll be able to make your own bongo drums. Decorate your bongo drums with a Caribbean design. Home-Made Drum or Bongo Craft - - Make a pretend drum using items you probably have around the house. Homemade Drum Craft - - Help your child participate in the wonderful sounds of music. Music is fun and you can even create a song to go with your new drum. Indian Drums - - Like others around the world, Indian cultures used drums for music, ceremonies and communication. Modern musicians recognize the expertise needed to create these instruments and their value to Indian tribes. With some effort and attention to detail, drummers today can recreate Indian drums. Kai-lan's Chinese Rattle Drum - - Announce the New Year with happy noise. When kids flip the drum back and forth, the action sets the beads in motion, creating a celebratory rattle and bang! Karate Kid Spinning Drum - - So maybe I can't catch a fly with chopsticks, but here's an instructable for you to make your own spinning drum, just like the one Miyagi-san gives to Daniel-san in The Karate Kid II. OK, maybe not JUST like it, but pretty close and just as much fun to use. Kids Project: Making Bongo Drums - - Bongo drums are made in pairs attached in the center and played with the hands. The instrument was developed in eastern Cuba and gained popularity in America in the 1940s and '50s. Today, you can create your own set of bongos using coffee cans and oatmeal containers. Lighted Drum Ornament - - Turn a recycled baby food jar into a drum Christmas ornament with a little Modge Podge and some tissue paper. Little Drummer Boy - - I made this little drum and it kept the kids entertained for hours. To make this craft project a bit easier, I've created a template for the images I used on the outside of the drum. I hope you have fun creating one for your little lovely. Little Drummer Boy's Drum - - Whether you're part of the playtime band or part of the parade this drum is sure to make a hit. Little Drummers - - While today’s children may enjoy staging mock battles, warfare was no game during the 1860’s. Nine-year-old John Lincoln Clem survived two wounds and Confederate imprisonment to become the youngest non-commissioned officer in Army history. Like Clem, most boys started as drummers, calling soldiers to meals, waking them in the morning, and rallying them for marches. You can make a Civil War style drum, too. Lollipop Drum - - So what's a lollipop drum you ask? A lollipop drum is a handheld drum (sort of shaped like a lollipop) that you spin in your hand to make noise. Make A Drum - - Whether you're part of the playtime band or part of the parade this drum is sure to make a hit. Decorate it in the colors of your flag for the holidays. Make a Box Drum - - A simple box drum is an excellent portable drum with a beautiful and unique sound and is relatively easy to make. Each finished box drum will have its own distinctive sound, depending on the type of wood used, the thickness, and the patterns that have been drawn. Make a Gourd Drum - - Traditionally constructed gourd drums require rawhide and a gourd. These are items easily found our purchased. Read on and follow the prescribed steps to make your own gourd drum. Make Your Own Snare Drum - - The snare drum is one of the most important drums in a drum set. Stretched across the drumhead, it has strands, also called snares, that are made from metal cable, metal wire, gut cords or plastic cable. The snares are usually on the bottom drumhead of the drum, but the Caixa drum has snares at the top and the bottom. With some time, care and patience, drum enthusiasts can build a professional-looking snare drum. Marching Drum - - No Mardi Gras parade could be complete without a marching drum! Here is how your children can make their own. Margarine-Tub Drum - - Loud salutes have been an Independence Day tradition since the Liberty Bell rang in 1776. Your child can sound off with this rhythmic noisemaker. Mini Backpack/Marching Drum - - Every child likes to have a few fun items to play with when going somewhere and this project provides a small backpack to carry them along safely and neatly. When worn to the front it also doubles as a nice marching bongo drum that has a soft, pleasant tone unlikely to give parents a headache. Mini Bongo Drums - - These little drums are really cool and very easy to make! Monkey Pod Drum with Polynesian Petroglyphs - – Bring a slice of Polynesian aura to your playroom with these monkey pod inspired drum set made out of oatmeal containers. Bring music to your home with a personal and creative touch. My First Drum - - Paint and transform an ice cream tub into a drum. This drum craft includes a pair of drumsticks and a strap that will allow you to wear the drum while you play it. My Little Drum - - This is an updated version of an old favorite that starts with a fun painting technique and ends with the addition of drumsticks. It's the perfect project for your little Thanksgiving "Indian" or your little holiday "Drummer Boy" (or girl!). The best part? This is a VERY quiet drum. The one in the picture was made by my 3 year old grandson. Native American Drums for Kids - - Make a Native American drum for kids to enjoy fantasy play. Most kids will eagerly work to make crafts that provide them with a toy in the end. A Native American drum can be crafted from common household items and fuel the imagination. Native American Pow Wow Drum - - For the Native American, no matter what tribe, the most sacred thing was Mother Earth. Without the earth as their mother, no tribe would have had food or shelter. This article will give you some tips on how to make a Native American pow wow drum. Oatmeal Box Drum - - Making a drum out of an empty oatmeal box is a great way to spend a rainy afternoon at home. This kind of activity costs nearly nothing but it gives children a creative outlet for both art and music. Oatmeal box drums aren't even too loud to be annoying. Oatmeal Drum - - Learn how to make a drum for a child out of a leftover oatmeal container. Out of the Box - - Turn unwanted holiday packaging into a quick-and-easy drum kit! Paper Cup Drums With Preschoolers - - Paper cup drums are a great way to keep your preschoolers entertained on a rainy day. Using simple materials that you have around the house, you can help your children create musical masterpieces. Best of all, these paper cup drums are not too loud, so you won't have a racket on your hands once the glue dries. Paper Mache Drums - - This colorful drum kit will keep the kids entertained on any boring day. Give it a try and use some creativity in the making process. Paper Plate Drum Set - - To engage your musical child, you could pay a pretty penny for a really nice set of drums, but there are other options. With a bit of creativity and a little tape, you can make a paper plate drum set that sounds great even if it doesn't look professional. And you can get your child involved in making her own paper plate drum set. Paraguayan Drums - - Paraguayan Indians are known for stretching animal skins and making drums. So, drums it was. Younger children might need help with this part. Plastic Bowl Drum - - Kids will love to make music with these easy, homemade musical instrument crafts for kids. Plastic Drums - - Drums are played with drumsticks to tap out a rhythm that adds to the rich sounds of a band or orchestra. Drums can be made of many kinds of materials, including plastic. A plastic drum can be easily constructed with a few simple steps and some basic household materials. Plastic Yogurt Container Drums - - Do you have a little aspiring musician? Need something for your tots to do on a rainy day? In a few simple steps you can create your own set of drums. All you need is a few empty yogurt containers, some glue, scissors, construction paper, a plastic straw and creativity. Preschool Drum Out of Paper - - Drums make great instruments for all ages of children, including those in preschool who have trouble with other instruments that require a lot of manipulation. The following is a way to make a paper drum for the preschool age. Ra-ta-tan-tan - - Make some noise! Drum to entertain kids of all ages. Recycled African Drum - - Make a drum out of a coffee can and some basic supplies. This is a very kid friendly project! Recycled Christmas Tree Drum Ornament - - With the motto, "don't throw it out", you can create anything out of something. We created this drum ornament using a plastic black hairspray cap and other items. Shoe Box Drum - - Making a shoe box drum is a great way to teach music and history to young children. Through the construction of the drum, children learn how the drum's sound is made and how it is amplified. Playing their own drum creation will give children a sense of satisfaction in their ability to make music on their own. Slinky Drum - - It is time for your slinky to do more than crawl down stairs. Tape Roll Finger Drum - - This one stems from the fact that I now have to use masking tape across the top of my daughter's nappy for it to stay on! It's a home made percussion instrument. A finger drum. It could take anywhere between an hour and a few days depending on how much time you have, how detailed you want it to be and how many interruptions you get! The Beat Goes On - - Drum-shaped ornaments are among the most iconic Christmas decorations. But you don't need to scour antiques stores and flea markets to drum up your own set -- all it takes to make the ornaments are plain wooden boxes, festive ribbon, and glue. Toilet Paper Roll Drum Ornament - - Use these free directions to create a neat drum ornament using a toilet tissue roll. A great Christmas tree ornament or.pngt. Toy Drum - - This little drum is made from a coffee can. Your child can help with the painting . Children love arts & crafts and they love playing with something they helped to make. It is time well spent on a rainy afternoon. Toy Tin Drum - - Use a recycled tin to make a musical instrument for your toddler. Trash Can Drum - - Young percussionists can march to their own beat on this easy-to-make instrument. Xylophone Drum - - A child loves to make music. With this simple to make xylophone you won't mind the banging. It is durable enough for all children, yet can be tuned and altered for any adult to play.